“I’m a kindergarten teacher in a Washington state school district. School districts all over Washington were on strike at the end of this August into September (some are still on strike like Battleground and Tacoma). The reason this is occurring is the Washington state legislator was sued about 7 years ago for not fully funding education (class size, teacher salaries, supplies, etc.). Over the past 5-7 years, teachers all over Washington state have been holding rallies and walk-outs to pressure the state legislator to meet the demands of the lawsuit that required them to better fund public education. School staff, school boards and administrators all joined together to demand the state legislator honor these requirements. In my 5 years of teaching, 3 years had events such as previously mentioned. And this past spring, great news! The legislature announced it was sending millions of dollars to each district in Washington for teacher salary raises and support for schools! However, our victory was short lived when the school boards and districts began to say they could not give us the full percentage of money that was intended for us, because they might need it as a cushion for other things in the district. My own district received 45 million, and 22 million was meant for teacher salaries (that would’ve been a 20% raise for us!) Our district offered a 1.9% raise instead. After fighting for years together we were betrayed by the very people who said they were there to support us. As a young teacher, I am in $70,000 of school loan debt after finishing my bachelor’s and master’s degree. I had 5 years of experience and a master’s and was making $47,000, and as the primary income in my household, we were living paycheck to paycheck. Many of my older colleagues who have been teaching for longer topped out on the salary schedule years ago, but with no cost of living adjustments and rising health care costs, they were actually losing money every year they taught. Many Washington districts refused to bargain with teachers on this money, so we went on strike. 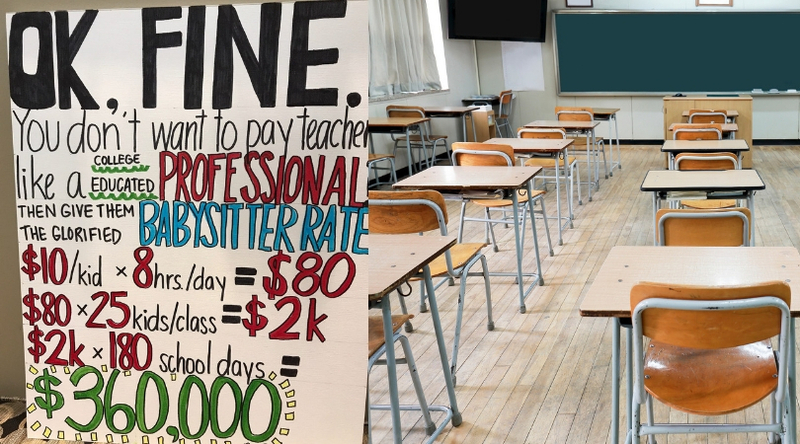 Teachers are caring people and often put their own needs aside for the benefit of the students, so strikes are not taken lightly. But it was necessary to put our foot down in order to gain the respect we deserve (I also wonder if teaching was a male dominated profession instead of female dominated if pay would not be higher anyways.) We had a lot of support from our community, however some people scorned us for striking, accusing us of being greedy and undeserving of a raise. The comment has often been made that we don’t deserve a raise because we get summers off and are just glorified babysitters, hence the sign. This poster was made by the friend of one of my colleagues during our strike as a rebuttal to this aforementioned argument. So, this story is not about me really, but all the educators who walked 12-14 miles a day, in the hot sun and rain, some for a day or two, some for 2-3 weeks. When I saw her poster, I asked for a picture and posted it to Facebook- I was not prepared for the reaction it got. People have reposted this hundreds of times, and last I checked there were over 10,000 comments! I am proud to have gotten some eye-opening information out there! This story was submitted to Love What Matters by Kensie Elaine. Submit your story here, and be sure to subscribe to our best love stories here.